Greater Mooses Tooth 1 is the first field located on federal lands in the National Petroleum Reserve in Alaska or NPR-A. 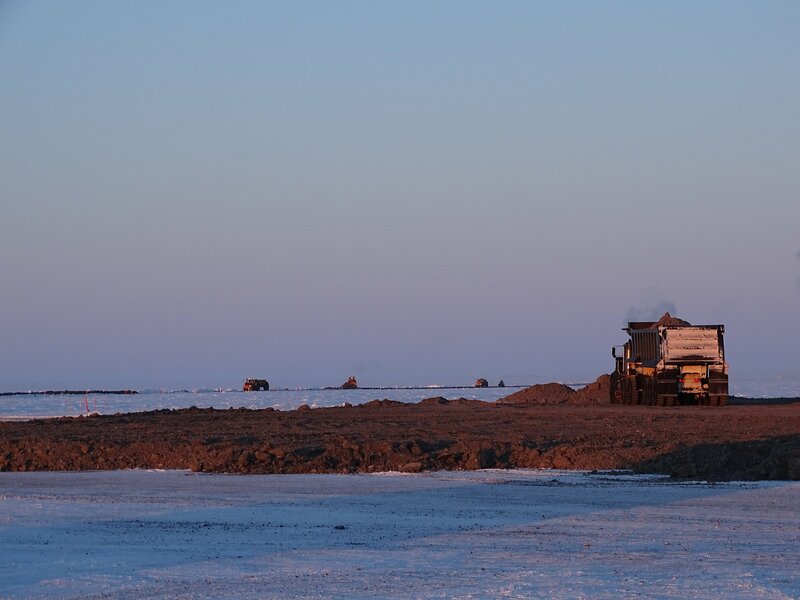 ConocoPhillips Alaska Inc. has started production at the farthest west oil field on Alaska’s North Slope, a site that is part of a westward expansion of Arctic Alaska oil development. The Greater Mooses Tooth 1 drill site, or GMT1, came on line on Oct. 5, slightly earlier than the anticipated late-2018 startup. It’s the second producing oil field within the borders of the National Petroleum Reserve in Alaska, or NPR-A, and the first that is located on federal lands and leases. A ConocoPhillips field called CD5 located on Native-owned land within the reserve started production in 2015. Both CD5 and GMT1 are considered satellites of the huge Alpine field in the Colville River Delta area; oil from both GMT1 and CD5 is processed at Alpine before being sent east by pipeline to the Trans Alaska Pipeline intake station at Prudhoe Bay. In the NPR-A and elsewhere on the western North Slope, ConocoPhillips has been the most active explorer and developer. Other companies have exploration projects underway, but ConocoPhillips’ projects are the most advanced. The company is awaiting a decision from federal regulators that would allow development of its Greater Mooses Tooth 2 project, or GMT2, located about 8 miles southwest of GMT1 and about 20 miles southwest of Alpine. The BLM, in a final environmental impact statement released in August, endorsed ConocoPhillips’ plan for GMT2, which includes up to 48 wells and a gravel road link to GMT1. If approvals are granted, ConocoPhillips says it plans to spend more than $1 billion to develop GMT2, that production could start in 2021 and that the site will produce 35,000 to 40,000 barrels at its peak. ConocoPhillips is also planning a larger development in NPR-A, the Willow prospect, which it says is big enough to justify stand-alone processing facilities. Regulatory review of that project is just starting. Gov. Bill Walker hailed the new production as part of a positive trend on the western North Slope. “The onset of oil production at GMT-1 is good news for Alaskans who will benefit from new jobs and increased production in the trans-Alaska pipeline. The Department of Natural Resources played a key role in permitting this project and is working with industry, local communities, and federal agencies on other promising oil prospects in the NPR-A,” he said in a statement. However, GMT1 oil is not expected to contribute much money to the state’s general fund, at least in the early years. Under federal law, all NPR-A royalty and leasing revenues are split evenly between the federal and state governments, but the state’s 50 percent share is funneled into a fund dispersing grants to North Slope communities impacted by NPR-A development. The state administers the National Petroleum Reserve-Alaska Impact Grant Fund, disbursing money to communities for specific community projects. Oil produced in NPR-A is subject to state taxes, but state law grants substantial reductions in those taxes. Under state tax law, “new oil” — a category that includes the new NPR-A production — qualifies for a series of deductions and credits, including an exclusion of up to 30 percent of gross value from tax calculations. The Trump administration is pushing for additional NPR-A development and has declared its intention to overturn Obama-era protections there. The administration is seeking to start leasing environmentally sensitive areas that were put off-limits in the 2013 integrated activity plan. None of those tracts will be offered in the upcoming 2018 NPR-A lease sale, said Gina Kendall of the BLM’s Alaska state office. “No unavailable tracts are going to be offered,” she said. That annual sale will be held later than usual, and the date has yet to be set. “We’re looking at a mid-December sale,” Kendall said. That is a change from the practice during the Obama administration, when the BLM scheduled its annual NPR-A sale for the same day as the annual Arctic lease sales held by the Alaska Division of Oil and Gas. The state-federal coordination of lease sales was aimed at maximizing bidder interest and participation. This year, the Division of Oil and Gas will hold its lease Arctic lease sales on Nov. 15.